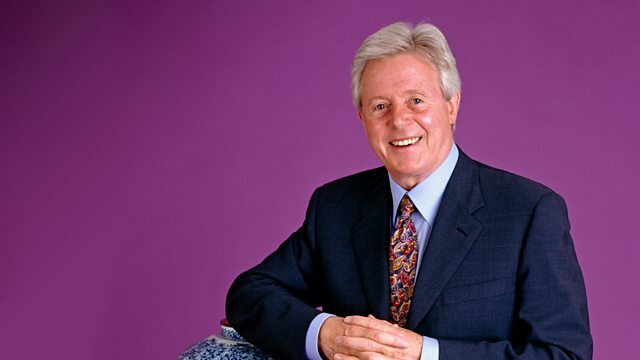 Michael Aspel invites people to offer up their antiques for expert examination. In Mount Stewart, finds include a silver tea set and a Wedgwood cup. Browse content similar to Mount Stewart 2. Check below for episodes and series from the same categories and more! the magnificent home of the Londonderry family, now managed by the National Trust. there are one or two intriguing things elsewhere in the grounds. a top-dog social club formed in 1915 by Edith, Lady Londonderry. and she gave each member an animal nickname. Stone me! Another part of the grounds and another statue. where they remained forever young. who still lives and farms here at Mount Stewart. where she was brought as a baby for her daily nap. and 97 acres of the Mount Stewart estate that are open to visitors. earning the gardens a World Heritage site nomination. Among the exotics - possibly the world's most northerly banana tree. and a bed of begonias forming the Red Hand of Ulster. -So tell me about your stove. -Well, it's a family thing. -but it's certainly been there in our lifetime. -Which is a fair number of years. -Have you ever seen it up and running? -It just sat, as an ornament, in the porch. ..just to look at it. The first thing you've got to say, it's made of pottery. It is to a certain extent copying the sort of thing that you would have expected in metal. -it would talk to you in a very broad Yorkshire accent. This is the pride of Leeds. It shouts, "I was made at Burmantofts." This is a heat-resistant clay. -Let's look at the construction because I think it's fantastic. because you've got this almost Japanese feel to the actual cover. and then these almost Norman arches. So it's borrowing all sorts. -you've still got the original burner in there. -because it originally would have taken a chimney in there, so there would be illumination. and it would just get that glimmer of light through the tracery. -at between sort of £500 and £800. So I suppose the big question is can you get it working again? this is perfect to bring out. Well, I was given it, a present from my mother over 20 years ago. it says "Mary Stewart" on the back with number "2". because she's hoping to get a cruise and a new house out of this! I don't think so, but it is very, very interesting. It may not be as old you think. it's 19th-century, when the Mary Queen of Scots cult was popular. She almost turned into a saint. and it's typical of his work. Do you wear it? -Because I'm just missing two little stones from it. Well, absolutely no trouble in doing that. in homage to Mary Queen of Scots, and it'd be rather sought after. It won't take us round the world, but it will take us a small way. -Um, what shall I say? £2,000. But it's not entirely true. and that work as a ceramic object, and this is one of them. -"Fantasque" - which is the range. -because there are a lot of duds of these coming on the market. And some are very deceptive. How long have you had this one? before their wedding, and they were married in 1939. Right. So this was about 1938.
by a friend who was in the Guides with her, or something like that. It may even not have been new when she got it. -'20s, '30s is certainly when it dates from. This is a pattern called "Secrets"
and it's a really nice object. -It's obviously a sugar caster, you realise that? -It was used by my mother and father. Now they're in an nursing home. It came out of the sideboard and everybody else said, "Ugh,"
and I always liked this as a child. -sugar shakers seem to have slightly gone out of fashion. -Teeth. I've got a sister-in-law who's a dentist. -Well, I wouldn't recommend using it, it's too good. -To chip it would be a tragedy. Oh, that's lovely, that really is. I'll tell my mother. by this artist on the Roadshow, but at last, I've got a real one. I'm talking about Birket Foster. and how nice it is to see how good Birket Foster can really be. It's just a watercolour of astounding quality, isn't it? -Everywhere you look. Is he an artist you've always liked? -The detail is fantastic and I've always admired him as an artist. It's the only one I have. which was incredibly minute, and he must have used very small brushes. His technique was to build up the watercolour almost in dots. but also to get the fantastic detail. which he was so brilliantly good at. but that's what the Victorians liked. the sheep look fat and healthy - there they are, all in the fold. and this is England as we'd all like to think it perpetually is, and always will be. -When did you buy the picture? And what did you pay for it? It cost me £10,000, yes. -Birket Foster certainly would have cost that sort of amount 15 years ago, but he has gone up. -Insurance - you must think £30,000. and one of the nicest and finest Birket Fosters you could ever see. had one of these narwhal tusks. It was probably brought back as a part of the spoils of the whaling fleet. country houses had them, for they thought they came from a unicorn. and all old country houses just had to have one of these narwhal tusks. and it all goes together nicely. Lovely. Do you love it to bits? useless but decorative, with a good bit of history behind it. Well, my understanding is that is a potato ring in Irish silver. I have always known of it as a potato ring and it is 100 years old. My grandfather won it playing golf in Greenore, as you can see. -seems strange, I think, for an Irish silver potato ring. This is actually a copy of a mid-18th century example. -..When there was a fashion for Chinese decoration. -Now the next thing is - it's not a potato ring. Everybody CALLS them potato rings. -It's actually a dish ring. and ever since, everybody has referred to them as potato rings. was actually to literally to protect the table tops. -they developed this idea of little rings to protect the table. and you get things known as dish crosses then. But in Ireland, they continued to develop and became much taller. -And all references to these in the 18th century are to dish rings. There's no 18th-century reference to a potato ring. -The dish sitting on top may have had potatoes in it. -It was basically whatever you wanted to go inside. -Oh, I thought it might be worth a couple of hundred. pushing towards 200 years ago. And very, very lovely. -Have you any idea what the value is? £1,000 - which is very nice. I'd like to show this to John. ..Lovely piece of Wedgwood. -Three coloured jasper, isn't it? Looks nothing that way, but put a light behind and it's transformed. -A lithophane. Terribly difficult things to make. Very few factories produced them, and this one is a Belleek one. So when did you get this one? I bought it about eight years ago, at a private auction. And what date was it given then? It was given here... It's a Madonna and Child. 1865 - when these were produced. -and do fetch considerable amounts of money. What did it cost? Well, that wasn't bad for an 1865 lithophane. Should be worth more. But we have one problem. there is a letter "r" in a circle. That mark came in the 1950s. This is a reissued one. A modern version of the Victorian original. So an early lithophane - you're talking £2,000 - would have been a great buy. Instead you've got a modern one, worth what you paid. with a nice light behind. What super quality. What a lovely Viennese wall clock. -but at each quarter it does the preceding hour as well. Does that drive you mad? You've got a lovely steel-rodded pendulum. that you'd get on a lesser clock. have a small panel on the top and then a full panel below. and a rather nice gilt brass bit of frieze around there, rather rather nice altogether. and double satinwood lines here. It's a great quality thing. and this is the noise that you'll get out of it for the whole time. -The quarters and the hours. Very pleasing. What did you pay for it? for anything between about £9,000 and £12,000. -So you've doubled your money in a year. -Yeah, although it's a keeper. you won't find another in a hurry. was on the ship Mars in the Battle of Trafalgar. and this was what he got at the end of the battle. And this was presented by the other officers and men out of respect. -Now, the silver itself is hallmarked for 1805-1806. The Battle of Trafalgar was that year. It doesn't mean to say that it was immediately presented. but it was made at that time of the Battle of Trafalgar and then presented afterwards. -he is THEN a captain, but he was a lieutenant on the Mars. you're going to hear a lot about Nelson and his battle. -because there will be all sorts of things happening in 2005, I know this for a fact. you're looking at something possibly not worth £1,000. because Nelson and the Nelson period was magical. at the condition of some of the objects that come on the Roadshow. -Bacon and egg and custard. and they're absolutely typical of the late-19th century. These designs lead through to Art Nouveau. This is where Europe got Art Nouveau from - looking at Japanese objects like this. ..one would say in huge quantities in the 1870s and 1880s. but some - they absolutely pushed the boat out. -Japanese - enormously skilled at metalwork. they put little bits of metal bronze, inlaid in gold and silver. those metalworkers turned to making these vases for the Western market. and that's a really nice touch - unusual. people look at that and say, "dirty". Out with the polish and they wreck them. I think they're really very nice. -It's broken on the end. -What do you mean "could be"? OK, do you put it in your ear? -Is it for washing out your ear? Is it for something down round the nether regions? -OK, tell me what it is. Unfortunately, the box is just a bit... It's very very old. -You've got the original box? -A "reliever"? So it's for expressing milk? Fascinating dish ring, this one. but we've got Dublin marks for the latter part of the 18th century. -What's the history behind it? -So it's not one you've bought? And just there is the other solder line. That's where the strip of metal's been let in. It's about ten years' imprisonment for transposition of hallmarks. -That's OK, it wasn't me. It wasn't you, no, no, this was done some time ago. -and then it'll be worth £1,000, or so. For an illegal object, great! It's a Newton's celestial globe - 1860. -almost 100 years earlier than the paper on here. -It's one of a pair, so there would have been the terrestrial and the celestial. three little places where the three little struts went to hold the round compass in the centre. it's a colour to die for, this is as good as it ever gets. little vase there... is 1770-1790 at the latest. it's probably had five or six different papers on here, until 1860. -I wonder where the other one is? -My wife bought this as a one-off. -£60 about 28 years ago. -today's value - £3,500 to £4,000. -You should be proud of me! -Next time we're having a party, we'll remove it from the room! It's a very fragile thing. ..Who or what is this? -Jar Jar Binks from Star Wars. -Was he in Star Wars? But what is more important is what Binksie is hiding. and at the bottom there's a pipe holder. -The pipe holder goes here? -And cigars in there. Very clever. -But you don't smoke a lot, do you? -So how did you get it? Well, kind of for a long time, cos my great-grandad got it. -How did he get it? for giving them food for the children. -So this was in the Second World War? -In one of the concentration camps? -And now you've got it. -How many years later is that? "English, French, Turks and Russians. One dozen. "William Pigit," I think. "Victoria Avenue, 1857". That's enough to whet anyone's appetite. Look at that, absolutely superb. I have never seen such a superb set of soldiers from that period. although they do, obviously, have some lead elements. Their firearms are, in fact, lead. which is completely original, with its original packing, and to me that is absolutely incredible. -How do you happen to have them? -I was left them by my great-uncle. -And I know very little else about them other than his father, grandfather maybe, had them. that relayed everything back to the masses. People went on a tour - you could anchor offshore and watch the battle in progress. it wouldn't surprise me if it bettered that at auction. -and I bought the box for a few punts. And amongst the drawings was this picture. which is just south of Whitby. -I think it's a quite valuable watercolour. -Worth more than the few punts you paid. At auction - probably worth nearly £2,000 to £3,000. -So that was a wise investment. and wrote off and got three of them, in fact. so I suppose in the 1920s, sometime, she wrote off and bought three. Well, in 1920 it wasn't terribly old. Alexandra Theodorovna, the last Empress of Russia. more important than even Christmas is to us. and they exchanged chickens' eggs, or perhaps wooden eggs. As one moved up in society, they turned into porcelain, then gold. for the last Tsarina to give as a presentation piece. thought that they were made in very large quantities and weren't terribly personal objects. and the Empress and the Dowager Empress would hand these out. so you should try and value this object. And it IS valuable. Beautifully made by the Imperial Porcelain Factory. I think we can confidently say this would go between £800 and £1,200. Oh, my goodness! I hadn't expected it to be as valuable as that! -and my mother didn't know how long he had had it. So it has been in the family for years. -You've no idea where he might have got it from? -We know he worked in France as well as in Northern Ireland. -and that is from Nancy in France. Nancy is one of the centres of Art Nouveau, French Art Nouveau. and being inspired by plant forms. on the flat part of this little desk or table. I like the way it's, in some ways, taken its inspiration from Japan. And you have these tendrils which go all the way down into this little curlicue down here. -Now, have you ever looked at this closely? -Well, it actually says "Galle". but also for this wonderful, inlaid furniture. and he supplied very, very high-quality furniture to big exhibitions. which made commercial furniture, if you like, using this amazing inlay. Now you've had it in your family for a long time, so I don't know if you have any idea of its value? Not in the slightest. My mother never really liked it - we were the ones that loved it. Mother would have parted with it, only we wouldn't let her. -So I'm very glad you didn't let your mother get rid of it. watch Inside Antiques on BBC4 immediately after this programme. a complete set of the Indian figures by Fred Gertner. They're incredible - four of them. -This is a spare one? -How did you get them? -but I'm looking after them. I know what boys are like! But it's wonderful. or should we call them Native Americans now? Used to be Red Indians when Fred modelled these. and they're wonderful colours of the Art-Deco period. The reds and the blacks, wonderful colours indeed, and the modelling is splendid. and irrespective of the value, they're wonderful. Especially to see this Indian with his feather on the back. I've never seen one with the feather intact, and this is perfect, isn't it? How has that survived? You've looked after it very carefully. Been told not to touch them! I should think so! Don't play football around them! But it's incredible that they have survived. And the ladies have papooses on - little babies on their backs. and these are their squaws and this is the brave. And that's the set of four. -Have you any idea of their value? -No. I just know they're interesting and they're Royal Worcester. -Yes, never had them valued? They would be in his shop at about £3,000 or something like that. So I think you should insure them for £3,000, at any rate. -He hasn't been out of the bag for 40 years at least. I haven't been keeping him, my daughter has kept him in a bag. She was scared of the baby swallowing it. -She was thinking more of safety. -and it is put in with a machine and it's jolly difficult to take out. -But having said that, he's known as a teddy clown, obviously. and very few remain, particularly in good condition. so your daughter must have put it in a moth-proof bag or something. The colour is an unusual colour. -I would call it mauve. and, for some reason, because it's different material, it's faded a bit more. -Now, have you got any idea of his worth? -Some months ago I had an approximate valuation. This January. Off a dealer. -He offered you some money? -He didn't. Oh, no. He thought it was worth between £2,000 and £3,000. And he didn't offer you that? and he wanted 10%, and then the auctioneers would be in London. So I told my daughter and she says "Well, I've done without for many years and I'm not going to part". Well... I would put a nought on that. Is there a wheelchair to take me out of here? you'd have to pay £20,000 at least, at least. not a great deal less - we could be talking about £15,000, even at auction and going up. That's the other thing - going up, so good investment. It's well worth the journey here, well worth the wait. it makes you feel small and insignificant. We've had a wonderful time in Northern Ireland. Thanks to Lady Mairi Bury and the National Trust for making us so welcome. With apologies to Ronnie Corbett, it's goodnight from me, as I close the book of another show. A second visit to Northern Ireland's magnificent Mount Stewart where Michael Aspel and the Roadshow experts uncover more intriguing heirlooms. Finds include a silver tea set presented to mark the bravery of an officer at the battle of Trafalgar, a rare Wedgwood cup and saucer, and a teddy bear that has been kept in a box for 40 years.